Born to a middle-class family, Virtuo would seem like a child like any other, going to school, and coming home to a family that loved him. Except this is only part of a truth, Virtuo was home schooled by his father, who was a professor at the Corellian University, Virtuo kept his grades up, and tried his best to please his father, he got along just fine with his father, going on fishing trips, hunting, and watching the occasional podrace on Tatooine. Unfortunately, this all ended by age 7. His father was called in to the Republic military to serve as a medical specialist, by this time, Virtuo’s mother began drinking sporadically, and most nights would abuse Virtuo, calling him worthless, degrading him, and even breaking his favorite possession, a toy blaster. These three years of parental abuse caused Virtuo to have a slight mental breakdown, he stopped playing with his friends, and quit his education. One night, Virtuo’s mother went berserk after hearing that Virtuo hadn’t been in school for almost a month and cut his face with a broken bottle as punishment, Virtuo ran up to his room, and in the middle of the night, snuck out of the house. Virtuo walked to Coronet, and after he got there, he had no idea what to do, he had no money, and had no food with him. He eventually was found by a group of travellers, whom were actually Jedi. They offered him to come with them to Coruscant, Virtuo didn’t hesitate, he went with them, and eventually ended up in the Jedi Temple. After being initially screened, the Jedi sent him off to the world of Alzoc III, as he stepped off the shuttle, he idly placed his hands in his pockets, he felt small holoprojector inside, pulling it out and switching it on revealed a picture of him and his father, with his father smiling happily at him, and Virtuo holding the first fish he ever caught. Only thing was that he never put that in his pocket…. That picture would be the source of inspiration to him for a short time. As the cycles passed, Virtuo was initiated and his journey began with the Archives, pouring all the time he could into studying what he was able to in order to become a successful Jedi. During his three years as an initiate, Virtuo gained a reputation as a good listener and a quick learner. Eventually his Initiate Trials came along and he passed them with little difficulty, thanks to the time he spent in the archives, and became a Novice Learner. 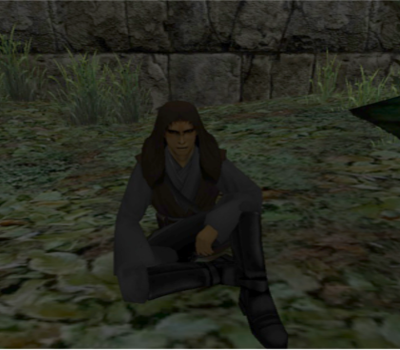 Not long afterward Jedi Knight Kiwron Tirladdik took Virtuo as his Padawan Learner, that’s when his real training began.